Double-length brilliance from the mighty Sahib Shihab – a set that collects a number of killer 60s sessions with members of the Clarke Boland Big Band – all of them great! The small combo work here is amazing – hard-hitting modal jazz that matches, if not tops the best MPS/Saba sounds of the time – all produced to perfection with a really sharp edge, and a cutting approach to jazz that's gone onto inspired countless others in the current scene – including artists on Schema and Ricky-Tick Records, as well as most Japanese club jazz combos! 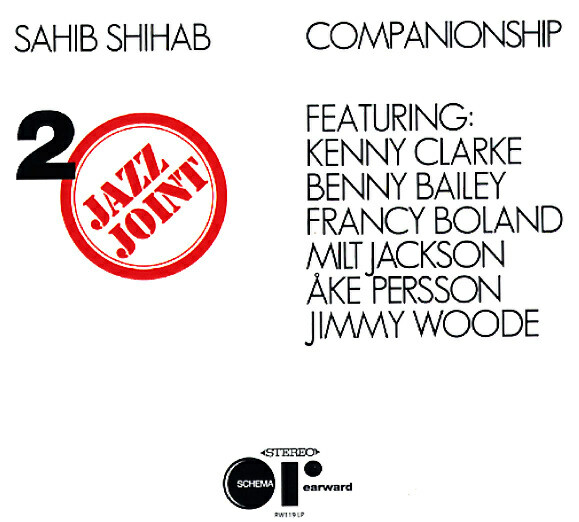 But long before any of those cats started copping his groove, Sahib Shihab had it all totally together – a great ear for his own amazing solos on baritone and flute, and a way of hooking up with players like Francy Boland on piano, Fats Sadi on vibes, Benny Bailey on trumpet, Jimmy Woode on bass, and Kenny Clarke on drums. All players here were Shihab's partners in the Clarke Boland Big Band, and they use these small combo sessions to explore some great new ideas – stripped-down groovers that are heavy on rhythm, and really allow full expression from all the players involved. Titles include "Companionship", "Om Mani Padme Hum", "Bohemia After Dark", "Serenata", "Yah Yah Blues", "Balafon", "Talk Some Yak-ee Dak", "The Turk's Bolero", "CT + CB", "Jay Jay", "Stoned Ghosts", "Just Give Me Time", and "Dijdar". © 1996-2019, Dusty Groove, Inc.